"As any pro guitarist will tell you, touring season is a very brutal time. You need dependable gear. I choose Egnater Custom Guitar Amps. My set up consists of the Egnater Tourmaster 4100 amp head along with the Egnater Renegade 212. These are the tools I use to forge my sound and the power to move some serious air in any size venue. The lush, clean tones. Sweet, bluesy overdrive. Thick, rich distortion to satisfy any player." Calling Chicago, IL his home, Ric Hall aka “Ric Jaz” currently performs around the world with Blues legend Buddy Guy. Ric’s 30 year plus resume includes a surreal list of Rock and Roll Hall of Fame and Grammy Award winning artist (BB King, Albert King, Eric Clapton, John Mayer and many more). True to his versatile style, Ric has proudly served as the guitarist and rhythm section leader for The Dells (Rock and Roll Hall of Fame, R&B inductee). Other R&B artists he has performed with regularly include: Jerry “Iceman” Butler (Rock and Roll Hall of Fame), Bloodstone (R&B, Funk) and The Emotions (Soul, R&B and Disco). Ric provides an impregnable rhythmic foundation and is eager to interject soulful “teeth grinding” guitar licks. His crossover style performs a melodic séance to the roots of Rhythm & Blues to a tasteful and current Rock shred. His distinguishing personality and showmanship has commanded the attention of audiences worldwide. 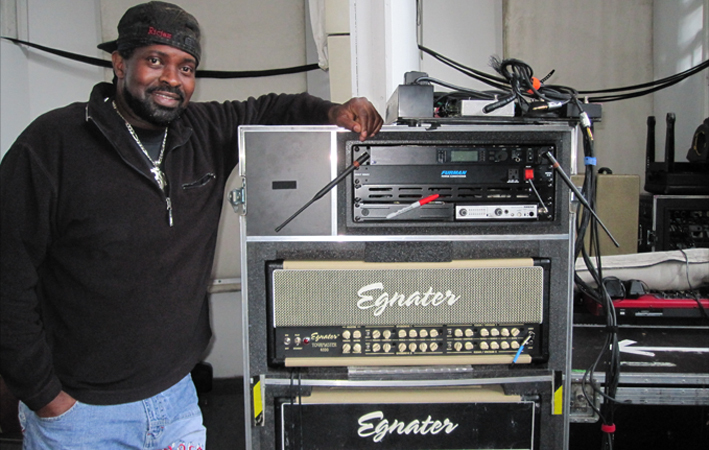 Watch Ric talked about his Egnater touring amps below!